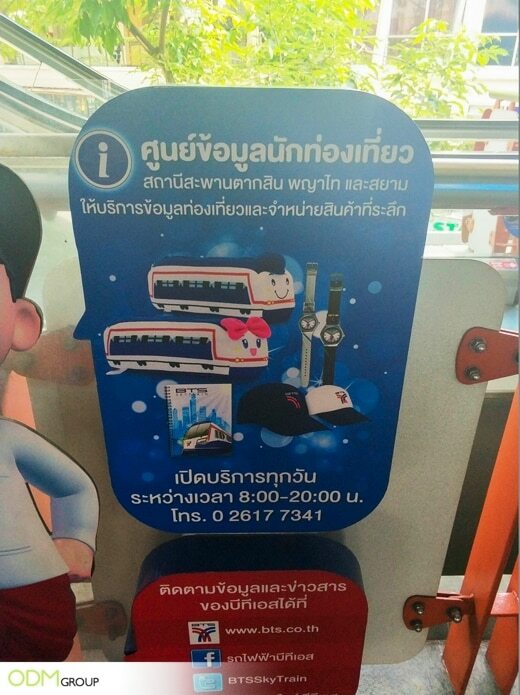 BTS, or Bangkok Mass Transit System Public Company Limited, has been keeping commuters updated through their custom outdoor displays in Thailand. 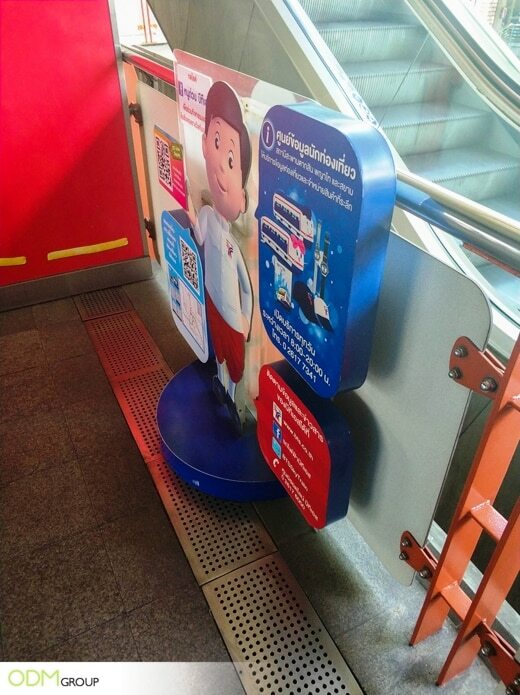 The transport company has been using an acrylic display with their official mascot as the main design to disseminate information to the public. What we love about this display is that it is very informative and the design is easy on the eyes. We can see that the signage shows their social media pages, their exclusive branded merchandise, and travel route and schedule. Can Withstand the Changing Weather: Durable materials, such as plastic and acrylic ensure the longevity and sturdiness of the display stand. This makes it ideal for outdoor marketing where your display is constantly exposed to the elements. Improves Online Presence: You can see useful information posted on the speech bubble and this is important for getting in touch with their commuters. 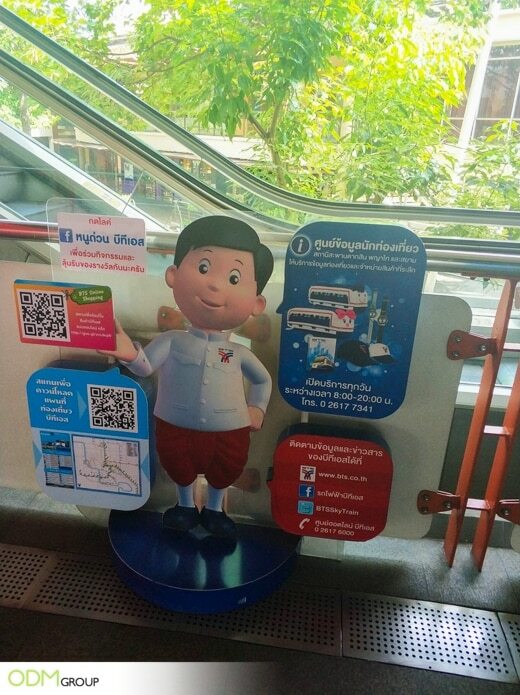 Having their social media pages posted allows commuters to be part of their growing online community. Since commuters are almost always online, the company can give the people an up-to-the-minute update about their services. Exclusive Merchandise: BTS souvenirs are available for retail at Tourist Information Centers. They offer promotional plush toys, sky train keychains, sky train purse, watches, and branded caps. Such souvenirs are popular among tourists which means local and international exposure for the company. Done right, an outdoor display can help maximize brand impact in so many ways. Not only do they keep the public informed, but the more bespoke ones also serve as a decorative piece. Here, at ODM, we can help with any types of outdoor displays, custom POS display units and retail sign ideas – be it small or big. Outdoor displays, POS displys and free standing display units are a fantastic addition to your marketing projects. They command attention, ideal for information dissemination campaign, and direct people to your brand. That is why we recommend businesses to have a display unit custom-made for their company. Speak with our designers and marketing professionals today! Aside from POS displays, our team can also help with designing, sourcing and manufacturing of promotional products. We can help develop product ideas for retail for the drinks industry, cosmetics, and more. For more marketing inspiration, we compiled some of our favorite blogs below. Ferrero has been able to market their chocolate their Asian market with these custom CNY chocoltae POS display. Check it out below!